When it comes to starting out as a guitar player, you’re going to need an instrument you can actually depend on upon and enjoy playing. One of the most common practices when it comes to buying a first guitar is to spend as little as possible. The general thought is that if you can stick it out and continue to show interest in learning to play, that a more expensive model will eventually be worth a purchase. The dreadnought body style is a classic that innumerable guitar players start out with. While it lacks a cutaway that gives you better access to the higher frets, the extra wood gives, even more, a resonance that will help you settle right into the full, shimmering tones that make people covet the acoustic guitar in the first place. Anything beyond the 15th fret is mostly for a show when played traditionally, but you can easily make use of the higher frets when combined with a slide. This is a great instrument for playing country, folk, blues, or even classical on. Of course, there’s nothing stopping you from using it to learn all of your favorite hard rock, metal, and punk riffs either! As for the instrument itself, the aforementioned price nets you some notably high-quality materials. For instance, the body has a solid spruce top made from Sitka, with rosewood backing and sides. The bracing is comprised of scalloped Sitka to give you a bit of easier fret access. The nut and saddle are made of bone, and the fretboard itself is high-quality rosewood. You’re also going to get D’Addario EXP 16 phosphor bronze strings equipped on the guitar from the factory. Once you double check that the instrument is in tune, it’s going to sound great straight away. 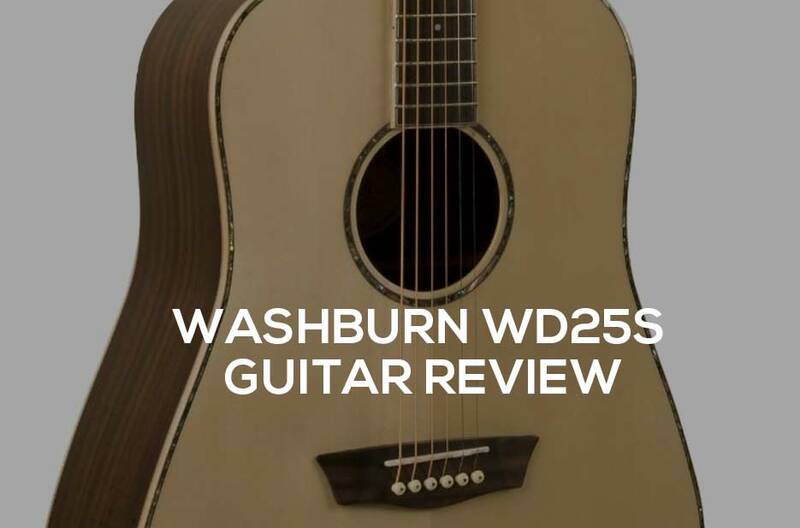 Overall, the Washburn WD25S is a stellar acoustic guitar that makes for a wonderful first instrument. Although a little pricier than some might like, it hits the sweet spot of high-quality construction and parts and a value that's more than fair for what you're getting. This is a guitar you're going to want to pick up and play even after you've been at it for a couple of years. The same just can't be said for most of the cheaper, "starter" guitars out there. Opt for one of the accessory bundles if you can, and you'll be left with something that will give you the best chance of being absolutely hooked on the instrument for the rest of your life.